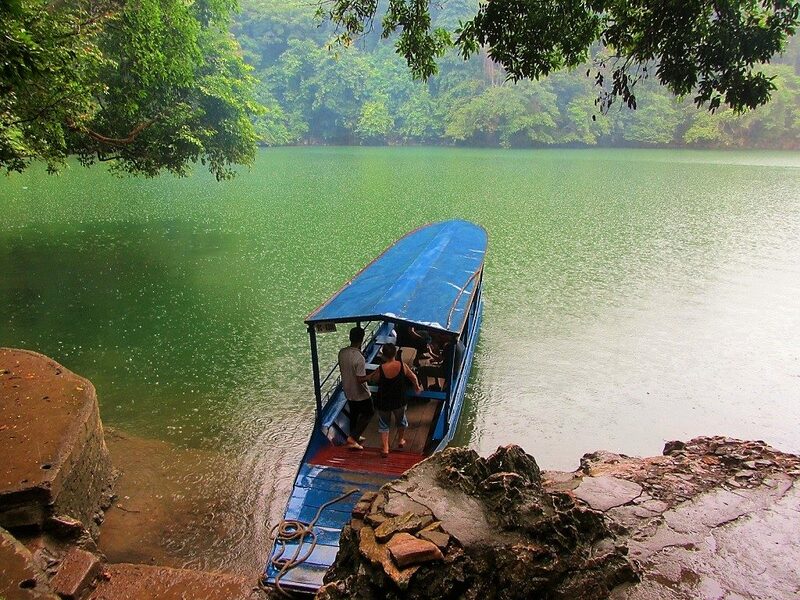 In one of the most sparsely populated regions of the country, the forest-covered mountains of Bac Kan Province, 200km north of Hanoi, plunge into the clean, clear, cool waters of Ba Be Lake. Limestone cliffs, riddled with cavities, meet the placid water at right angles, creating a spectacular backdrop to Vietnam’s largest natural lake. The setting could hardly by more exotic, more tropical, more romantic. 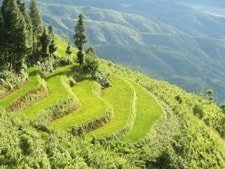 On its southern shores, where the terrain is slightly less vertical, several dozen homestays cater to the increasing number of foreign and domestic travellers who visit this area. Constructed on the lake shore or on raised stilts above the water, these homestays offer cheap, atmospheric accommodation and excellent home-cooked food (and plenty of local liquor, too). 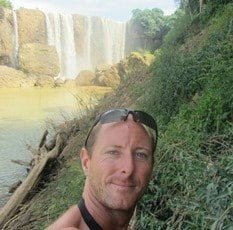 Spending a couple of nights at a homestay while exploring Ba Be Lake – swimming, kayaking, hiking – is a very rewarding travel experience. 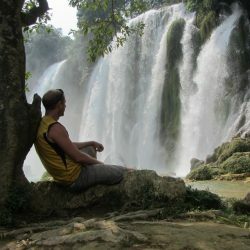 There are lots of Ba Be Lake homestays to choose from, but, in this guide, I have picked three that I particularly like: Mr Linh’s, Hai Dang, and Hoa Son. 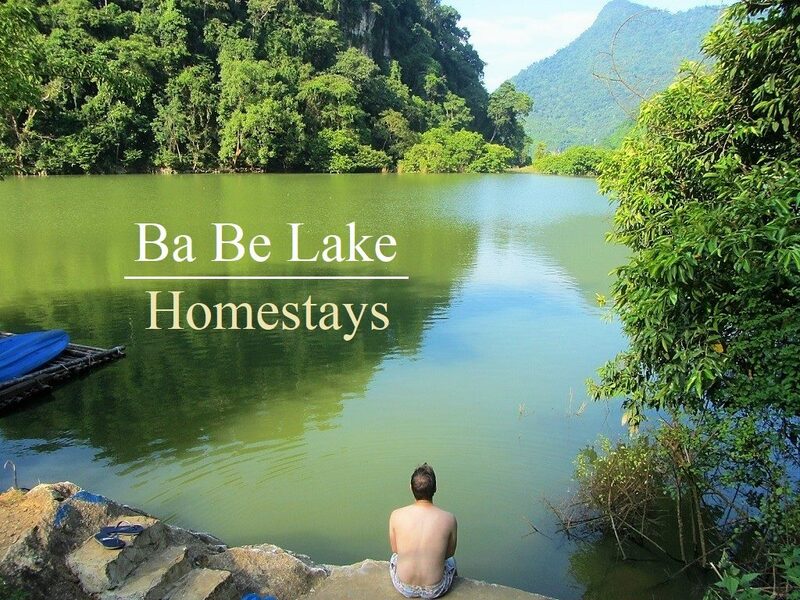 The three Ba Be Lake homestays that I’ve reviewed on this page are my favourites, but there are dozens of others, and new ones are opening all the time. (In fact, if the building boom isn’t controlled, it could become a big environmental concern.) I’ve included links and contact details for all three homestays. 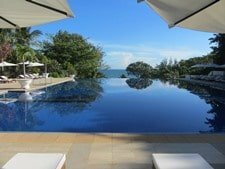 Booking in advance is advisable if you have your heart set on one of these particular places, because they can be full of weekends and public holidays. Some of the homestays have a range of accommodation options – from dorms beds to private rooms – and prices reflect this. Food and drink is a big part of the experience: guests can usually choose between full-board or half-board. Bear in mind that alternative food and drink options are limited, because there’s no real village nearby. The best time of year to visit is March to October (the winter can get very cold). Plan on staying at least two nights at Ba Be Lake: there’s lots to see and do, most of which can be organized by your homestay host. 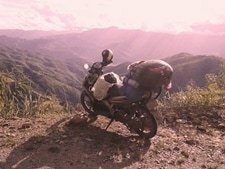 Transport connections to Ba Be Lake are O.K., with most visitors arriving by bus from Hanoi or by motorbike as part of a northern road trip linking Ha Giang and Cao Bang provinces. Again, your hosts can help arrange transportation to/from the homestays. *Note: Although on Google Maps it may look as though the homestays are not actually on the lake shore, in reality, if you visit during the summer and autumn months, rainfall will have filled the lake so that it comfortably reaches close to all three of these homestays. 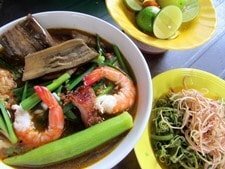 On the southwestern shore of Ba Be Lake, reached via a narrow lane winding through rice paddies populated by water buffalo wading knee-deep in the mud, Mr Linh’s Homestay is well-known, well-liked, and well-deserving of its local fame. It’s located away from the main cluster of homestays, at Pac Ngoi village on the southern shores, and as such is quiet, remote, and occupies an idyllic portion of land rising steeply from the lakeshore, surrounded by jungle, with mesmerizing views over the water. Mr Linh and his family run the homestay with the help of local staff, and, despite growing considerably, there’s still a pleasant, family atmosphere, including some adorable dogs. 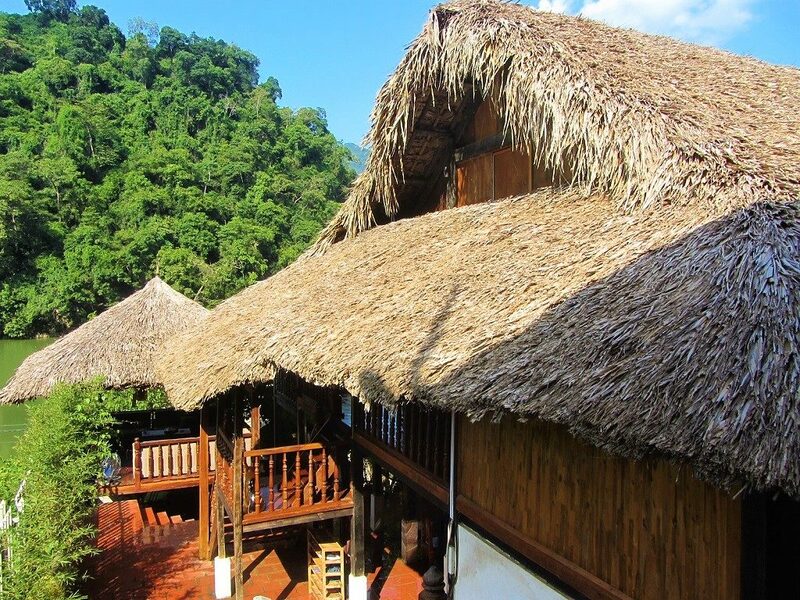 There are several buildings, mostly consisting of wooden houses with palm-thatched roofs and rattan partitions, ascending over several terraces up the hillside. 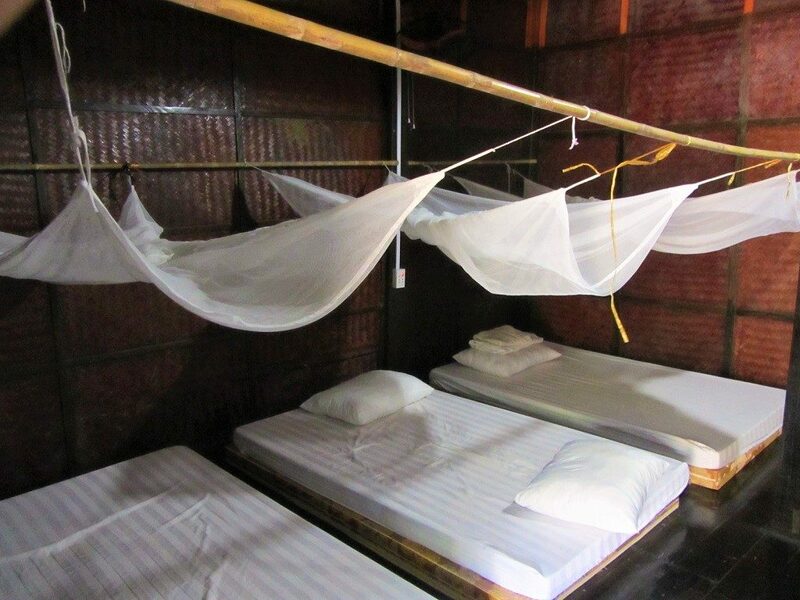 There’s a range of sleeping options and prices, starting with mattresses on the wooden floor under a mosquito net with a shared bathroom for around $8, to private double rooms with en suite bathrooms for up to $35 a night. Because of the range of accommodation, there’s also a range of guests, from budget backpackers to young professional couples and families. Food costs extra: breakfast (consisting of eggs, pancakes, hot soup, fresh fruit, coffee and tea) is around 50,000vnd ($2) per person, and dinner (a large spread of home-cooked dishes, including spring rolls, fresh fish, meat and vegetables according to what’s in season) is between 100,000-200,000vnd ($4-$8) per person. 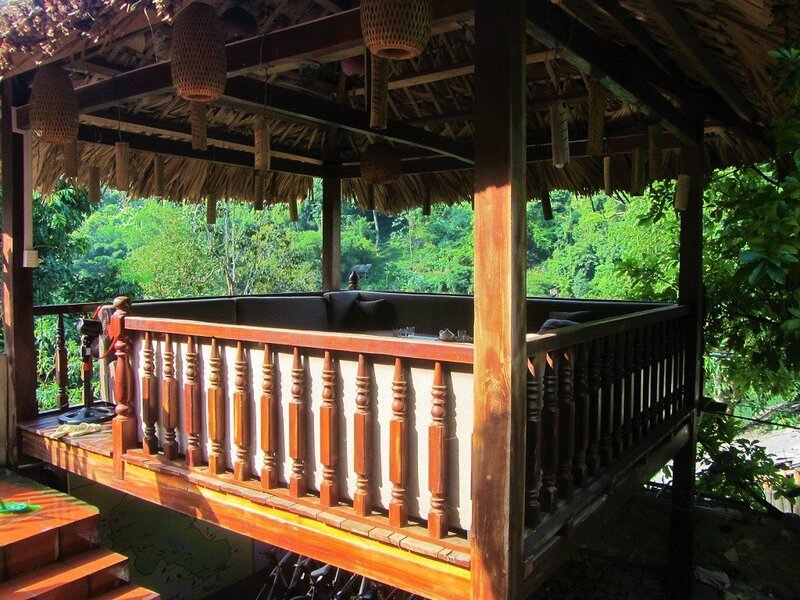 There are loads of activities to choose from at Mr Linh’s, including mountain biking, kayaking on the lake, boat tours to all of Ba Be’s sights, hiking in the jungle, and swimming off their own little boat pier. It’s a glorious setting and, providing the weather is good, you’re likely to have a whale of a time. There are a couple of concerns: At my last visit, there were the ominous signs of larger construction either side of Mr Linh’s, and, due to its popularity among travellers, staff are clearly a bit overworked and tired of dealing with the demands and expectations of their guests. Mr Linh’s isn’t really a small, family home anymore: it’s turning into a larger-scale accommodation, more akin to an ‘eco-resort’. 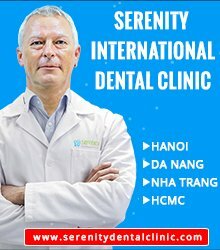 There also seems to be some kind of bad blood/family feud between the management of Mr Linh’s Homestay and Hai Dang Homestay. I gather they are part of the same family and now run rival businesses. Be warned that a kind of scam appears to exist where, if you call certain phone numbers for Mr Linh’s, the staff will tell you they’re full and recommend Hai Dang instead. 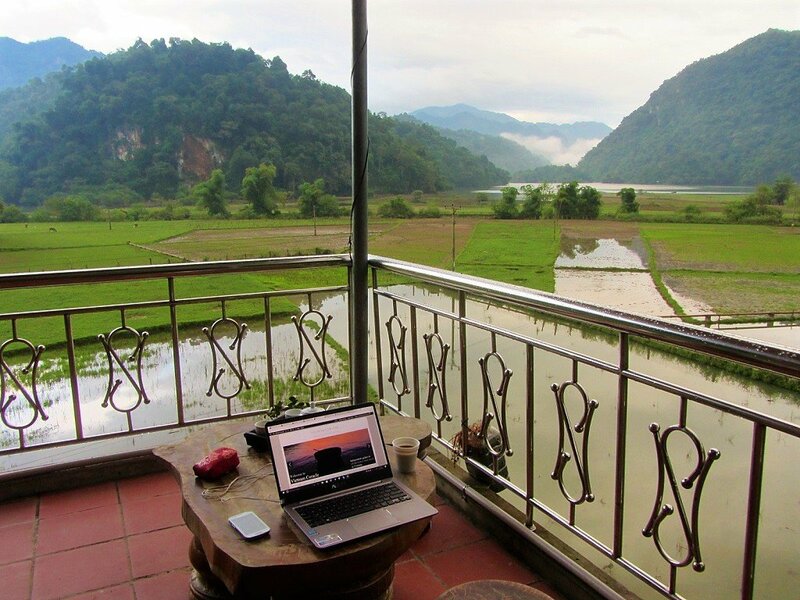 This isn’t so bad, because Hai Dang is a good homestay, too. However, if you’re set on Mr Linh’s, don’t take ‘no’ for an answer the first time: try the other phone numbers on their website contact page first. One more thing to note is that during the dry season, November to March, the lake’s waterline retreats and may not reach Mr Linh’s Homestay. Before reaching the turnoff for Mr Linh’s, a relatively new cluster of homestays lines the lake shore. Known as Bo Lu hamlet, the homestays here tend to use a mix of building materials: concrete, wood and thatch. Although not as pretty as the traditional wooden stilt homes, they are nonetheless quieter and not as cluttered as the main homestay area at Pac Ngoi village. My favourite of the Bo Lu homestays is Hai Dang, mainly because of its three simple, cheap, second floor rooms, which open onto a large covered balcony with panoramic views of the lake, mountains, and farmland. It may lack the aesthetic appeal and waterside location of Mr Linh’s, but the views and the price more than make up for this. There are several other rooms too, but it’s all about getting one of the second floor, lake-view rooms. Accommodation is only around 200,000-250,000vnd ($8) for double occupancy, with a shared bathroom. 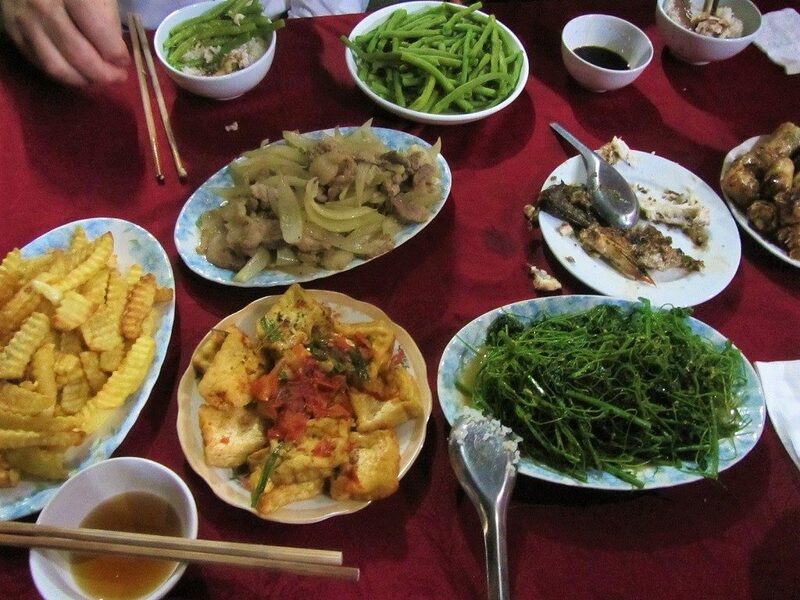 Food here is also very good: we had ginger-steamed lake fish, fresh sauteed greens from the forest, and fragrant rice. As usual, prices are about 50,000vnd for breakfast, and 100,000-200,000vnd for dinner. There’s no direct access to the lake from Hai Dang (except after very heavy rainfall, when the flood waters reach the bottom of the homestay). However, it’s only a pleasant 5-minute stroll through farmland to get to the lake shore, where there’s a grassy beach with easy access for swimming. Like all Ba Be Lake homestays, Hai Dang can easily organize boat tours, trekking, and various other sightseeing activities in the area. The three second floor rooms are especially good if you’re travelling in a small group of friends or as a family. When I stayed here, for example, my family and I occupied all three of the second floor rooms and thus had the balcony and the fabulous views all to ourselves. Even on rainy days we could sit outside with a drink, playing cards, and watching the mist and rain sweep up the valley and over the lake. One of the concerns about the increasing number of homestays at Bo Lu is that many of them are built on concrete silts right above the lake. Not only are they beginning to look a bit on an eyesore when seen from the lake, but overcrowding will soon become a problem, and waste might, too. 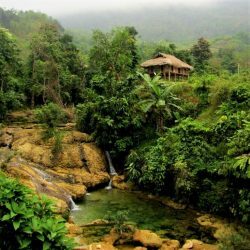 Cheap, friendly, well-organized and clean, Hoa Son is one of the better homestays in the main sprawl centered around Pac Ngoi village, on the southern shore of Ba Be Lake. With dorms starting from $5 a night and private rooms with bathrooms from $10, Hoa Son is good value for money. It’s located across the road from the lake with several wooden structures rising up the hillside. The views from the balconies are great and rooms are tidy and comfortable. It’s large enough to accommodate tour groups, but if you visit on a weekday, outside of public holidays, it should be pretty quiet. Food is good and all lake-related activities are available. Personally, I think the homestay scene at Pac Ngoi village (which began the homestay trend at Ba Be Lake) is becoming too crowded. There are dozens of homestays vying for space; for lake views or lake access. It’s in danger of becoming a bit of a mess, which is what happened to the homestay area at Lac village in Mai Chau. 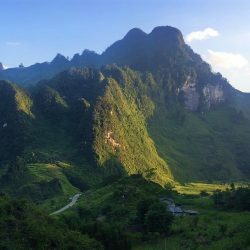 This entry was posted in ALL, Home Stays, HOTEL REVIEWS, National Parks and tagged accommodation, Ba Be Lake, Bac Kan, guide, home stay, homestays, national park, review, Vietnam. Bookmark the permalink. Nice piece again! The wife and I spent three weeks in the northern mountain, using a private car and driver. What a trip! We stayed at Ba Be and Mr Linh’s Homestay for several nights. Also ate there and paid extra for the food but well worth it. After dinner, Mr Linh broke out some of his ruou to share amongst the guests. During the time we were there, the water had receded quite a bit away from the homestay but seemed to give away to rice plantings where the water had been during the wet season. Very beautiful. Good to hear you enjoyed your stay at Mr Linh’s (at his ruou). Interesting that the rice fields sprout when the water recedes. What month was that?